KittysVintageKitsch: Frock Friday- Bangles & Barry M.
Frock Friday- Bangles & Barry M.
Sometimes you just have to let a bold print do all the talking. Well, ok I tried, but VB kept butting in, we were in a hurry to get to an antique fair yesterday but she wasn't letting Mum take a few quick photos without getting in the way joining in. Not only is she posing with me now, she's changing her outfit ten times a day and demanding nailpolish; can this be another Helga! in the making?? bangles- are you sick of them yet?? Well, a new fashionista is born, yeahhhhhhhhhh.She is gorgeous, just like mama. I adore that wonderful print, ahhhhhhhhhh so me. That last picture of you and VB is absolutely freaking gorgeous, you are both so pretty. Nothing beats comfy like a vintage muumuu, I have quite the collection myself - very pretty on you, thanks for sharing! Not sick of the bangles yet, by a long shot. Your babygirl is adorable! I love the pic of her kneeling in front of you. Most def a Helga in the making, I'd say. Lucky you! And your dress is wonderful! I love the big bold print and the maxi-est of dresses! That dress is lovely - so summery and looks very good on you. And the last photo of you and little VB is so gorgeous! That Frock is quite amazing *wow* It's like a swift punch in the cheek, just pops out at you. Love your bangles "Who could be sick of them?!" I am happy VB barged right in on your photoshoot *hahah* She is so darned cute. OoOohhh You both have pretty painted nails! Have a great weekend Kitty. 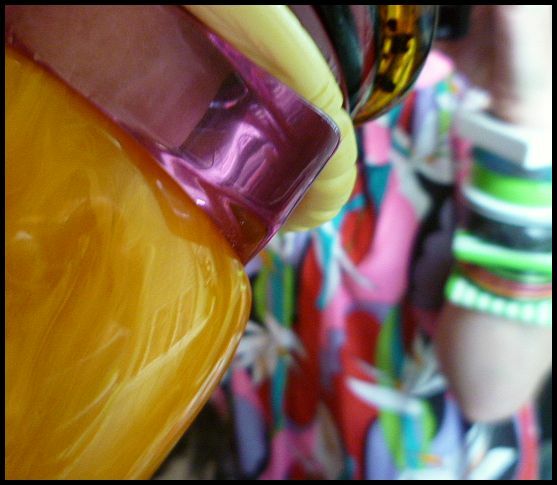 I love the colors in your dress and the bangles! You can VB look fab together! Love the dress Hun and VB is so cute. What is this vintage fair you speak of, where was it, how have I missed his vital information? So cute, she really is your mini-me! Now why did ya have to make me cry? You two are too too gorgous!! Ha,VB is SUCH a cutie!!! I'd be ever so flattered of she turned out like me!!hahaha! Love that frock,darling,the print is heavenly,and how perfectly comfy for your climate!!! I'm not sick of those bangles,how could anyone EVER be sick of anything fabulous?! aww she is so cute! Love the colours in your dress. It looks great on you! Gorgeous colorful maxi!You look spectacular amor. I wish I had a little girl to take fotos with me. I want more bangle love.Awww VB,She is a modelo in the making. adorar the last pic of you two smiling happily. That last gif is so gorgeous! I never tire of your bangles. Love that dress and your sidekick is pretty adorable! You are my swap parter, yeahhhhhhhhhhhhhhhhhhhh. I hope it is ok by you. Beautiful frock, beautiful VB, beautiful YOU!